during the last three decades. By taking advantage of cheap labor and quota-based market in the USA and EU under the provision of Multi Fiber Arrangement (MFA) of GATT, it attained a high profile in terms of economic growth of the country. The industry started its modest journey in late 1970s and enjoyed a meteoric rise from 30 enterprises in 1980 increased to 4825 in 20081. Average growth rate of this sector was over 20% per over the last two decades. This single sector alone earns about 80% of yearly foreign exchange of the country. Its contribution to GDP reaches 13% in fiscal year 2009-2010. Since independence, no single sector could accelerate the industrialization process in the country as the RMG sector could do. It has created employment opportunity for about 3.5 million people. Most of them are uneducated and unskilled. About 80% of them are women. To a creditable extent, it has been able to relieve the country from the burden of unemployment and at the same time contribute to the empowerment of women. Thus this sector is playing a vital role in socioeconomic development of the country. international buyers of finished garments, and workers. Of four parties, the first three are immense beneficiaries, while workers remain deprived. Government receives a handsome amount of revenue from this sector. Buyers, who get garment products at the cheapest possible price, make huge profits in international markets. Most of the local factory owners make adequate money out of this business to build palatial houses in posh area of capital, have their children educated and treated abroad, ride luxury cars, spend holidays at tourist resorts across the world. But garment workers, who make all these profits and benefits possible for other three parties, are to live a sub-standard life for years. The wage they get is low. Very often they do not get their salary, overtime bills and bonus in time. Their recruitment system is hiring and firing as they do not get any appointment letter and at any time they can be dismissed by owners for any reason. Being maltreated by owners and midlevel officers, working long hours in a congested room without sufficient rest, lack of recreational opportunity, nutritious foods, medicine, right to legitimate protest against ruthless exploitations, etc are their daily destiny. They don’t have any access to the decision making process. Factory building collapse, fire accident, stampede render many dead and 2 A Latin sentence reportedly written by Julius Caesar in 47 BC meaning easy triumph 3 injured. Nevertheless, if any worker protests against owners or management, he/she is threatened by various types of harassment such as dismissal, arrest or even physical assault by the hired hooligans of owners. There are allegations that a vested group is behind the violence in garments industry. Some Human-right-based NGOs are alleged to instigate the work-force in the name of their rights and privileges without knowing the actual capacity of the owners. Very often, agitating workers are aided by outsiders. Nowhere in the world is labor as cheap as in Bangladesh. 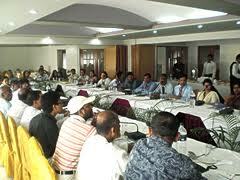 It is one of the main factors for flourishing of this sector in Bangladesh. Therefore, foreign conspiracies in instigating labor unrest in garment sector of Bangladesh cannot be ruled out as history records hundreds of wars to capture another market. At every incidence of labor unrest, police is deployed to disperse agitators. The coercive measures of the forces rather deteriorate the situation. Concerned groups engage themselves in blame game and do not waste time to put their readymade comments. Party in power always takes it as a subversive act of opposition party to destabilize government. Opposition party labels it as a failure of government and demands resignation. Factory owners blame workers and vice-versa. Very often, after some violent unrest, an inquiry committee is formed to look into the fact. But the fact is that, hardly people come across the investigation report. After some days people forget the issue and things go on as usual. Solving labor unrest in the RMG sector requires a collective effort. The root causes of unrest are to be explored. If private sectors (garment factory owners, managers, workers, BGMEA, workers’ association, members of civil society organizations, NGO activists) with their firsthand knowledge and experience work together with the public bodies, solution of this problem is possible. The growth of RMG sector in Bangladesh is amazing one and it has been possible mainly because of hard work of labor-force. Rashid, (2010) observes, “It is a story of success, of winning against all odds. It is a story of a nation, which has vowed to overcome all the barriers with limited resources and immense passion. It is not a story of “Veni Vidi Vici2.” Rather, it is a tale of toil, a tale of rising, of starting small and finally finding glory”. But this glory is being diminished day by day due to labor unrest in this sector. This study is designed to unearth the causes of labor unrest and search the areas where Public-Private Partnership can work to address the problem. Public-Private Cooperation is an agreement between government and private for bringing together social priorities with the managerial skill of private sector, relieving government of the burden of large capital expenditure, and transferring the cost overruns to the private sector. The success rate of public-private cooperation is high in western world. It is relatively new in Bangladesh and other South Asian countries. For the successful implementation of PPP in solving labor unrest in the RMG sector of Bangladesh, the level of trust, communication and co-operation between public and private sectors needs to be enhanced. A good number of researches have been done on various issues ranging from gender discrimination to impact of globalization in garment industry of Bangladesh. But no research is conducted on public–private cooperation approach to solve labor unrest. In this respect,this study is new one. It attempts to address a burning problem of vital sector of economy from an innovative perspective. Link with the research questions: The causes of labor unrest in the RMG sector of Bangladesh have been explored. Irregularities in payment, low wage, mistreatment of the workers by managers/ officers, rumor, absence of trade unionism, conspiracy, non-execution of labor laws, unruly nature of the workers and political intervention have been found to the major causes of labor unrest. The prospect of public-private cooperation in addressing labor unrest in the RMG sector is validated. Majority of the respondents emphasized cooperation of public and private sectors in four areas such as maintaining law and order situation, investigating the incidents of labor unrest, bridging gap between the owners and workers and involving the work-force in the decision-making process in attempt to solve the problem. 100% respondents emphasize the importance of investigation of the incidents of labor unrest occurred in the RMG sector. Majority of the respondents (44%) like to assign tripartite committee (a committee formed by the representatives of Government, owners and workers) the task of investigating the incidents of labor unrest which indicates a bright prospect of PPP approach in this issue.